A paper published in the journal Nature Geoscience sheds new light on the threat posed by decaying Arctic permafrost. But for once in the world of climate science, it is not all doom and gloom. Permafrost is soil or regolith that remains permanently frozen for two consecutive years. It occupies 24% of the Northern Hemisphere’s ice-free land area and is widespread throughout Arctic regions of Siberia, Alaska and Canada. What threat does it pose? The scientific community has become progressively more active in researching Arctic permafrost in recent years. This research has been pushed on to the agenda by the effects of a warming climate, which initiates melting and retreat of permafrost, a phenomenon observed in the Arctic in recent decades. Permafrost is rich in organic carbon formed from decaying plant matter, which is present in the form of the greenhouse gases methane and carbon dioxide. Hence, melting of permafrost releases these gases into our atmosphere, enhancing the greenhouse effect and warming the planet further. This sequence of events is known as a positive feedback cycle, a common occurrence in the climate system which can cause runaway warming of our planet. Such warming ensues as further permafrost melting causes greater warming and hence more melting, and so the cycle continues. Indeed, many rapid warming events observed within the geological record have been attributed to instantaneous catastrophic releases of methane associated with a warming climate. One such example is the Palaeocene-Eocene thermal maximum, a 5ºc spike in global temperatures caused by a pulse of methane released from melting gas hydrates (Zachos, J., et al. 2005). Where is our understanding now? Between 1950 and 2005 permafrost area declined from 12 million km² to 10.5 million km². Some models suggest that under current warming trends just 1 million km² of near surface permafrost may remain by 2100 (Lawrence, D., Slater, A. G. 2005). The volume of greenhouse gases emitted over this period has, until now, not been accurately measured. Because of this, much of our understanding of current and potential warming associated with permafrost melt comes from computer modelling. Such models suggest that a 3ºc temperature rise, in line with the IPCC’s 6.0 and 8.5 projections, could release 35-940 gigatonnes (Gt) of carbon, taking total warming to 3.5ºc (Maslin, M., et al. 2010). Such models take account of carbon released from both melting permafrost and methane gas hydrates on continental shelves. At present, 12-113Gt of this is estimated to be contributed by decaying permafrost (Schneider von Deimling, T., et al. 2015). Evidently, melting Arctic permafrost and the ensuing release of greenhouse gases is a major threat to our climate system. However, new research published in Nature Geoscience suggests that we may have been overestimating the severity of the threat. The paper, titled “Methane Emissions Proportional to Permafrost Carbon Thawed in Arctic Lakes Since 1950”, was published in the journal Nature Geoscience on 22nd August 2016 by an international team led by a group from The University of Alaska Fairbanks. This study is the first to accurately quantify the volume of greenhouse gases emitted from decaying permafrost. Using a combination of gas bubble measurements, computer modelling, radiocarbon dating and satellite imagery, the team was able to quantify how much methane and carbon dioxide was released from lakes in permafrost settings since the 1950’s. 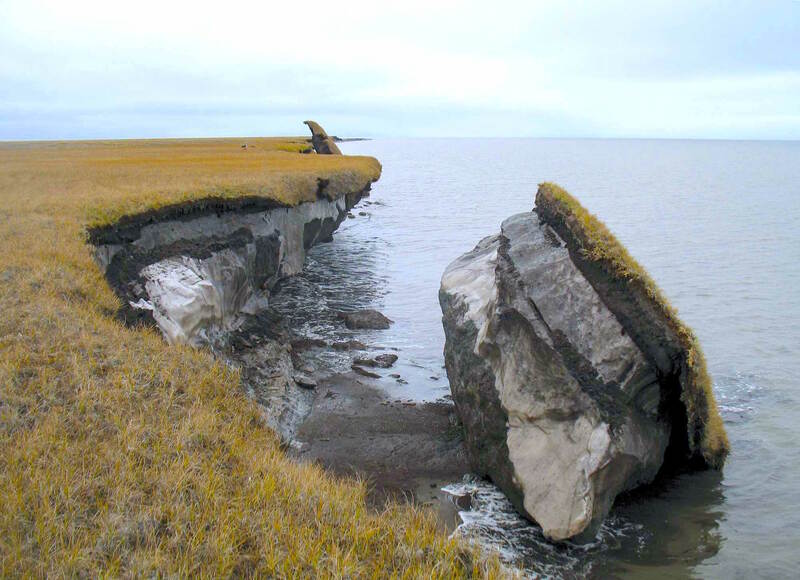 The study found that melting permafrost was the primary source of methane gas bubbles in thermokarst lakes; lakes which have formed in Arctic regions due to destabilisation and melting of permafrost. This was inferred from observing the radiocarbon age of methane bubbles emitted from thermokarst lakes, which was the same as the surrounding permafrost. Perhaps most interestingly, the study found that the rate of conversion of carbon in thawed permafrost into greenhouse gas bubbles was significantly lower than previously thought. Past estimates of this rate have come from laboratory and field experiments. The authors cite that this anomaly may be due to differing environmental conditions between laboratories and the field. Nonetheless, the observation is surprising and may have implications for modelling of future permafrost melting. The study goes on to quantify the amount of carbon, in the form of greenhouse gases, emitted from thermokarst lakes due to melting permafrost over the last 60 years. The study estimates 0.2-2.5Gt of carbon has been released over this period, with 0.1-0.3Gt in the form of the highly potent greenhouse gas methane. The estimate for the volume of greenhouse gases emitted over the last 60 years is significantly lower than may have been expected. Models similar to the one discussed in the “What is our Understanding Now?” section, which imply release of enough greenhouse gases to induce catastrophic warming, require greenhouse gas emission rates of approximately 0.115Gt per year from thermokarst lakes (Schneider von Deimling, T., et al. 2015). Given that this study estimates as little as 0.2Gt of carbon has been emitted from thermokarst lakes over the past 60 years, such emission rates would require increases on the order of magnitude scale. This study was confined to measurements from thermokarst lakes, with no study of greenhouse gas emissions from decaying permafrost in terrestrial environments, while many of the models mentioned above are chiefly concerned with terrestrial environments. Because of this, such comparisons as the one above are vague at best. Nonetheless, the observations of lower than expected greenhouse gas emissions are surprising, and from an environmental standpoint, not catastrophic. Permafrost is a large carbon reservoir, storing vast quantities of the greenhouse gases carbon dioxide and methane. Melting of permafrost has been observed at increasing rates across the Arctic over the last century, with models suggesting further rapid decay to 2100. Under the IPCC’s two most potent climate scenarios, modelling suggests that greenhouse gases released from melting permafrost would contribute a further 0.5ºc to global temperature. However, such scenarios would require emission rates of greenhouse gases from melting permafrost on the order of more than 0.1Gt per year. Over the last 60 years, 0.2-2.5Gt of greenhouse gases have been emitted from melting permafrost in thermokarst lake settings. There is major uncertainty surrounding the volume of greenhouse gases emitted from terrestrial settings in this time. Nonetheless, the observed rates of greenhouse gas emissions from melting permafrost is lagging significantly behind what would be required for such models to come to fruition. Polar amplification of global warming, seeing temperature rises in the Arctic in excess of 7ºc, is cited by the authors as being one explanation as to why there is such divergence between future modelling and present day observations of greenhouse gas emissions from decaying permafrost. Nonetheless, the study states “our research indicates that the dramatic increase in permafrost carbon emissions that is expected to imminently occur shows no sign of having commenced”. From an environmental standpoint, this is positive news. Permafrost undoubtedly represents a potential environmental catastrophe. However this research, though devoid of study of terrestrial environments, suggests permafrost melting has, thus far at least, had little impact on the climate system. However, like much in climate science, the emissions pathways taken by countries over the next century will play the vital card. If the Paris Agreement fails and carbon dioxide emissions shoot through the IPCC’s RCP 8.5 emissions scenario of more than 1000ppm, then melting permafrost will undoubtedly induce further warming in line with aforementioned modelling. Conversely, should the Paris Agreement be successful in limiting global temperature rise to below 2ºc, and the volume of gases emitted from melting permafrost remain stable or even rise slightly, then permafrost melting may prove not to be such an environmental disaster after all. Lawrence, D., Slater, A. G. 2005. A Projection of Near Surface Permafrost Degradation during the 21st Century. Geophysical Research Letters. 32. 1-5. Maslin, M., et al. 2010. Gas Hydrates: Past and Future Geohazard? Philosophical Transactions of the Royal Society A. 368. 1919. 2369-2393. Schneider von Deimling, T., et al. 2015. Observation based modelling of permafrost carbon fluxes with accounting for deep carbon deposits and thermokarst activity. Biogeosciences. 12. 3469–3488. Zachos, J., et al. 2005. Rapid Acidification of the Ocean during the Paleocene-Eocene Thermal Maximum. Science. 308. 1827. 1611-1614. Lewis Holden serves as an Associate within the Natural Environment Unit at Polar Research and Policy Initiative. Lewis is currently completing an MSc in Climate Change at University College London. He also holds a Geology degree from Imperial College London.